Carrie Patel’s Cities and Thrones is a follow-up to her novel The Buried Life – the mystery/sci-fi cross genre book. In this second outing, Inspector Liesl Malone is back, as is Jane – the young woman who changed the game in the first book. Now Jane is on the run from the city of Recoletta and Malone is the chief of the police, reporting directly to Sato. Just as Patel did with the first book, she has done a tremendous job of world-building. Here she brings us into a new city, Madina, that is every bit as complex and real as was Recoletta. The mystery/story is also just as strong with plenty of intrigue. I typically don’t find political intrigue stories of much interest, but Patel manages to infuse the political story inside the mystery which is set in a steampunk-like post-apocalyptic world. Yeah, it’s that complex. But in the hands of Patel, the story flows very smoothly and naturally and the complexity is made clear. Not just clear, but exciting and very interesting. Perhaps one of the best aspects about this book is the development of the characters. Patel gives us some character growth that just feels very real and honest within the bounds of the world and the story. This seems like it should be a natural story-telling technique but too often we see characters promoted or moved to another level to service a plot. Here the changes/progression come naturally with the developing story and we don’t seem to favor one over the other (character over story or vice versa). Instead, as with most good writing, we have a nice balance. After the previous book I hoped for more character depth, and I think we got that here, and the strong story bumps this rating up a notch and I truly look forward to more growth in the next volume. Looking for a good book? 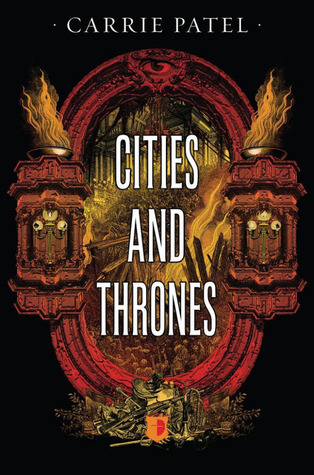 Cities and Thrones by Carrie Patel continues the Recoletta series and is even stronger than the first volume.